Happy December ChemEdX community! On December 2, 2014 I attended the second of three workshops on NGSS (Next Generation Science Standards) through our local ISD (in Kalamazoo County it is known as KRESA). This second workshop was much better than the first and allowed for brainstorming and problem solving on the teachers’ part as we worked together to craft and revise lab activities that would integrate the STEM components of NGSS, specifically the engineering components. A major contention of the teachers present was how to best integrate these principles without increasing our budgets. Remember from my last post that NGSS is a set of standards, guidelines if you will. NGSS is not a curriculum. So, again, the real challenge here is how to integrate and modify existing activities so that they include components of the 8 Science and Engineering Practices in the NGSS (think...more engineering). 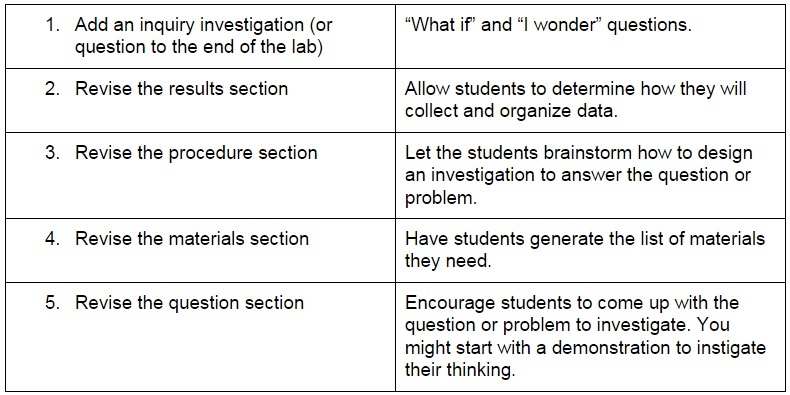 Some of you may be wondering how these practices are any different from simply doing inquiry-based labs. It isn’t much different, I don’t think. However, the above practices allow us to be more intentional with our students and help them to develop the necessary problem solving and critical thinking skills that we sometimes feel they lack. As I mentioned above, one of the purposes of this past workshop was for teachers to bring an activity and modify it with the intention of integrating an engineering component along with focusing in on one or more of the 8 Science and Engineering Practices in the NGSS. I will post my activity in a subsequent post. My aim for this post, besides updating the ChemEdX community about my “adventures” with NGSS, is to share how I went about modifying my lab activity. One of the handouts I received about this concept was an excerpt from a presentation done by Cheryll Adams (Ball State University), Alicia Cotabish (University of Central Arkansas), and Debbie Dailey (University of Central Arkansas) at the NAGC 61st Annual Convention and Exhibition (November 14, 2014). The title of the presentation was “Differentiating the Next Generation Science Standards at the Middle and High School Levels.” Particularly noteworthy was their inclusion of Douglas Llewellyn’s work (I think - reference isn’t clear) on modifying a traditional lab into an inquiry investigation. The following table summarizes that information. To start, I chose a straightforward chemical reactions lab where students would follow the procedure, record qualitative observations, and determine what evidence there was for a chemical reaction taking place. My modifications included changing the initial research question and adding a follow up inquiry question at the end. The follow up question at the end required students to make a new hypothesis based on recent data, design an experiment to test their hypothesis and form conclusions, and, lastly, create drawings/models of what was taking place throughout the experimental process. This inquiry approach took up most of 2 class periods and got students thinking about what was happening and whether or not their hypotheses (and preconceived notions) held any merit. As stated earlier, I will be posting the revised lab activity - so look out for it.